It's time for the Avengers to assemble at your child's birthday party. Get Iron Man, Hulk, Thor, Captain America and more to save your party from lackluster blues. We have everything you need for the ultimate Avengers party from papers plates and glasses to party favors. Your child will love this themed party and the popularity of these figures will only grow. The Avengers ensemble of tableware and accessories has everything you need to host a memorable event with your favorite superheroes in attendance! See all the party favors and supplies available with combination designs featuring The Hulk, Iron Man, Captain America and Thor. Marvel Avengers Superheroes 9" Square Birthday Luncheon Paper Plates 8ct. Marvel Avengers Superheroes 9oz. Paper Cups, 8ct. Marvel Avengers Superheroes Beverage Napkins, 16ct. 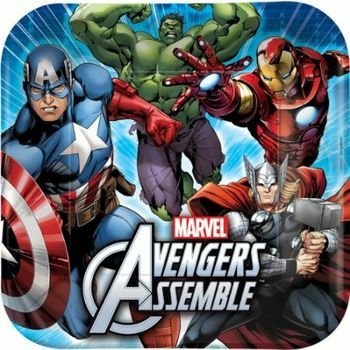 Marvel Avengers Superheroes Plastic Table Cover, 1ct. Mimosa Yellow Plastic Forks 24ct. Mimosa Yellow Plastic Teaspoons 24ct. Mimosa Yellow Plastic Knives 24ct. Marvel Avengers Superheroes Blowouts, 8ct. Marvel Avengers Superheroes Plastic Treat Bags, 8ct.